Sea level in New York City is far more sensitive to changes in Greenland's northern ice sheets than ice in is southern regions. Melting ice affects sea level rise differently depending on where it happens, according to a new model NASA is using to study the changing climate. The tool will help predict how the regional ice melt will affect coastal cities. Sea levels have already begun rising as ice melts and the oceans heat up and expand. Although these effects are mostly evenly spread across the globe, regional changes can create local differences, NASA officials said in a statement. This has direct ramifications for the 293 port cities included in the agency's new tool, which is freely available online. Small gravitational effects keep meltwater from spreading evenly across Earth's oceans. Large glaciers and ice sheets have a lot of mass, which attracts surrounding ocean water. As they melt, their pull decreases and water flows away. "In other words, sea level drops in the vicinity of a melting glacier but rises farther away," NASA experts said in the statement. Attributing a particular effect to each specific glacier or ice sheet establishes what's known as a sea level fingerprint. The program, developed by NASA's Jet Propulsion Laboratory (JPL) in California, also accounts for other effects, like contributions from Earth's rotation. All told, it shows how much sea level rise in an area can be traced to melt in a specific region. For instance, the specific location of mass loss in Greenland has different effects on coastal cities in North America and Europe. 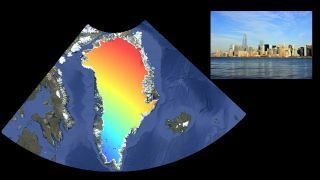 Greenland's northern ice sheets have an outsize effect on New York City, for instance, while the metropolis is less sensitive to ice in the island's southern regions. The agency developed the tool to aid coastal planners preparing for rising sea levels. "Now a coastal planner can understand and see how the melting or growing of a given ice sheet could be detrimental or beneficial to a specific location," JPL researcher Eric Larour said in the statement. As such, JPL designed the program to be usable without any training or advanced computing power. Using the new tool, Space.com learned that the high-water mark in Los Angeles is most sensitive to changes in Southern Greenland and Western Antarctica. The City of Angels is far less affected by ice melt in the Pacific Northwest and the Himalayas. The model covers 25 U.S. cities.